It’s a beautiful sunny day. I am sitting in Serenity, the 21+ pool area. There are screams from the nearby waterslide and snoring from an old man on the deck chair beside me. I am overlooking the back of the boat. I can see Nassau, Bahamas & Paradise Island with a very large and very pink hotel known as Atlantis. My heart is pumping slowly. My belly is full. It’s so nice to sit and do nothing after two weeks of road tripping. There’s palm trees swaying gently in the ocean breeze. Seagulls circling the boat searching for a free meal. The water is bright aqua-marine and constantly laps at the boat enticing me in, but I’ve already swam today and yesterday and for now I am content to sit on my lounge chair with my kindle to one side and my laptop to the other and let you know about my musings of my cruise through the Bahamas. After our rental car dropped us off at Port Canaveral about 11am, the porters were onto it. They immediately had our bags tagged and placed on golf cart trains for carrying to the boat. With a little tip they pointed us in the right direction letting us know that our 4pm departing ship was ready to be boarded immediately. This was a far cry from our first cruise in Sydney, Australia. It was 2011 and the line to get on stretched for miles with no relief from baggage until you reached the front of the line. 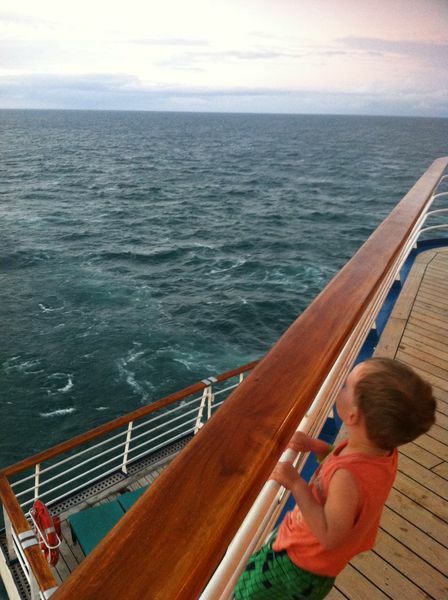 In 2011 our family did a Christmas cruise to the South Pacific for 10 nights with Royal Caribbean. It was over the Christmas period and the price was ridiculous. 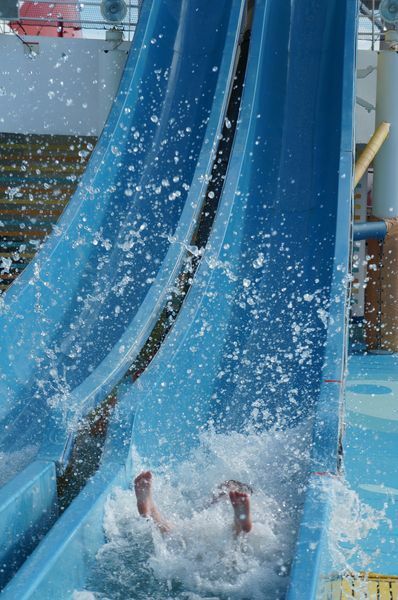 This Bahamas cruise we found online through vacationstogo.com. 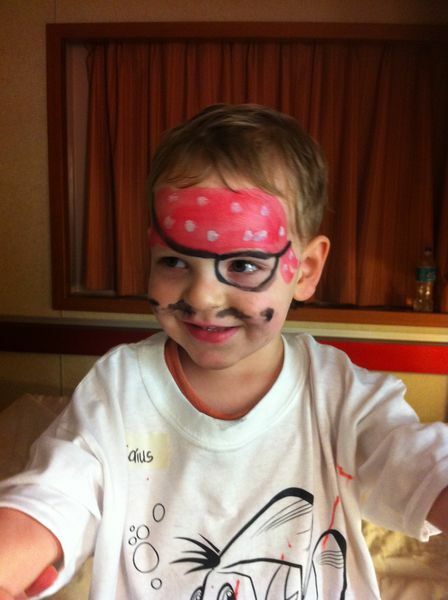 We chose Carnival because it is the only cruise line accepting kids 2 years old in their kids club. All other clubs are 3 and up. At 81% off the normal price, this cruise cost us less than $200 per day for all 4 of us. It was an absolute bargain. It seemed the cruises in the US and even in Europe are way cheaper than our Australian cruises. The boarding process was simple and quick. Although the lady at check-in seemed to be looking for some drama as she browsed through our passports worried we had no US entry stamp. Finally she found it and grudgingly allowed us on the boat. No queues, no wait, through security and on we got. They don’t open the rooms until 1pm and it was only 11:30am, however the lunch buffet was open and so were some of the pools. We all enjoyed a magnificent feast, before heading to the waterslides where, despite the cool day, Mia was soon going up and down over and over again while Caius played in the nearby kids’ water activity area. I watched as she climbed all the way to the top and came all the way down. As she splashed to the bottom, she shoved her hair out of her eyes and looked up, beaming from ear to ear. “I did it, Mum and I wasn’t even scared.” And that was the end of that chapter. 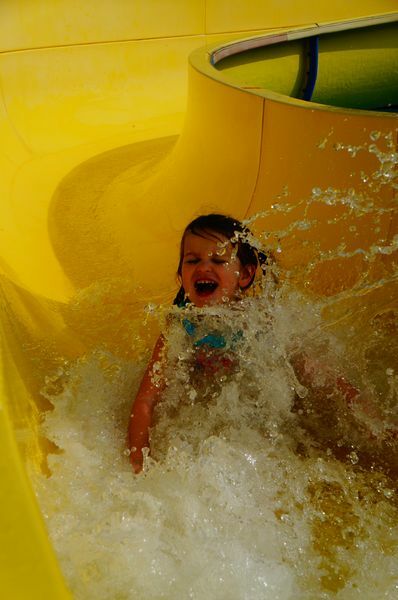 From that moment on she continued to go down the tunnel slide, fearless and proud. Finally we could enter our room so we all went down to check it out. It seemed a bit smaller than our Royal Caribbean room and not as well set out. One bunk is directly above the king bed, which I knew was going to be instantly claustrophobic for me. We decided that the kids would share the one bed on the other side of the room. The bathroom was set out well, despite the floor becoming flooded every time the shower was used. A quick call to our room steward had a plumber arrive and fix the problem. We unpacked all our stuff and put all our luggage away as it came. Caius and Josh eventually fell asleep so Mia and I went adventuring around the ship to find out how to get around. The mandatory safety briefing was at 3pm. 4pm was the kids welcome and registration. 5pm the boat was really rocky that night and my stomach was not feeling good. Mia and I went for a nap while Caius and Josh had some quality father-son time. They returned about 7pm and we all went to dinner. After dinner the kids went to kids club and I went back to bed. I was not feeling well from the rocking of that ship at all. At about 9:45pm I woke Josh up and asked him to go get the kids. 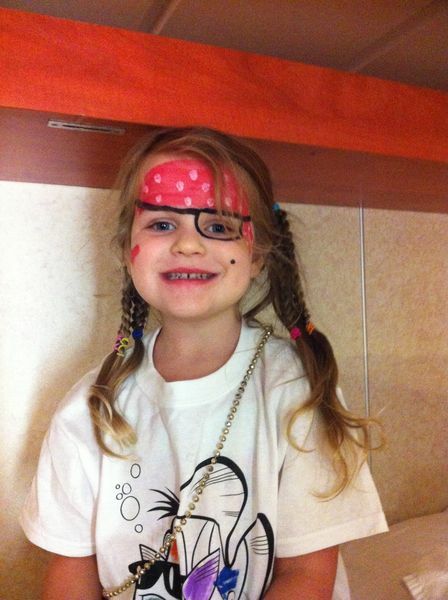 They returned in high spirits with pirate face paint and lolly goodies. 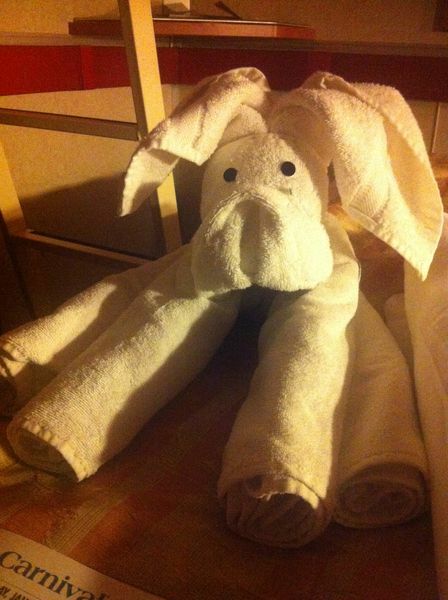 They were extremely impressed with their towel animal on the bed. They fell asleep quickly. We all did. During the evening my daughter woke screaming. The lights were all off and frightened she came into our bed. My son woke me the next morning wanting to get off the bunk. I woke happy, the nausea was gone and it seemed I was use to the movement of the boat. My husband broke my bubble letting me know that the ship had docked. We had arrived in Freeport, Bahamas. We all got dressed and went for breakfast. The kids were dying to get to Kids Club as their constant nagging reminded me, however it didn’t open until 10am. Fully clothed Caius made the decision on what to do next as he jumped into the whirlpool. After some pool and waterslide action we got the kids dressed and dropped them at the Kids Club, without a goodbye or “miss you” sob from them. Josh and I decided to go check out Freeport. Our first view of it was ugly. A huge oil refinery, owned by George Bush Senior, was directly in view. There were no palm trees, no beautiful ocean and really was rather disappointing. The area we entered was filled with tourists and we got talked into taking a taxi to the “nicest” beach on the island. It was a nice beach, but nothing on our beaches back home in Perth. Josh and I opted to walk a whiles away, plant ourselves in the sand and just enjoy the peace and quiet. No questions, no one eye open making sure the kids aren’t drowning or fighting and throwing sand, just me and him… now that’s romance. After awhile we took our $14 per person round trip taxi back to the port, happy to be leaving Freeport behind. We checked on our children who were resting and watching Ice Age and did not want to leave. So we left them there and headed to the Serenity pool, for ages 21+. I had a great time in the whirlpool making new friends and then lying on my lounge chair reading. It was bliss, I hadn’t felt that relaxed in a long time. Until “Mr Joshua Bender, please go to guest services” came over the loud speaker. Uh-oh what had happened? I raced to the kids club while Josh raced to Guest Services. At Kids Club my two cherubs were alone sitting on chairs. Apparently it closed between 4 & 5pm and we were meant to collect them. They let us off on a reminder and we took custody of our beautiful kids. After dinner we took the kids on the waterslides and in the whirlpools. Miss 4-year-old was itching to go back into kids club while Caius was too tired. When we dropped Mia off and Caius saw they were having a party with balloons he wanted to stay too. We had a lovely, quiet dinner without the kids and then made our way to the 8pm theatre show, Curves. It was a Vegas style burlesque singing and dancing show. Quite entertaining, but not quite the same as what we saw in Vegas or the variety of the shows we had seen on the Royal Caribbean. Although the main singers had remarkable voices and the band’s performance was faultless. After the show we picked up our sleepy kids and all headed to bed. Both kids fell asleep in seconds… I feel asleep quickly to during a movie Josh and I were watching in bed. The gentle rocking as the boat cruised through the ocean was a great relief from last night’s more noticeable pitching. “Knock, knock” was the sound I woke to this morning before housekeeping opened the door asking if our room was flooded. Let me tell you that woke me up faster than my children begging to escape the confines of their seriously high bunk bed. Turns out we were not sinking. Turns out some drunken fool had left their bathroom tap on all night and 3 rooms nearby plus the hallway were flooded. We escaped any damage. This morning we had pulled in, with 4 other large cruise ships, to Nassau, Bahamas. It already looked twice as better as Freeport. Given the choice the kids had once again opted for kids club so we dropped them off at the 10am opening time and jumped straight off the ship. You can read about our stay on Nassau in our blog post - The absurd $250 we spent in 3 hours at Atlantis Aquadventure on Paradise Island. When we returned Josh & Caius napped, while Mia opted to stay in Kids Club or rather cried when we said it was time to go & thoroughly manipulated I capitulated to let her stay. I had some great time at the Adults only section writing blog posts and watching the tourists come and go on the island. At 5pm I went to see if Mia was ready to come out and she was. We checked on Caius & Josh who were still asleep so snuck out to the hot tub. We made some great friends and Mia was the star of the show, as well as our travel stories. After an hour and a half we pulled ourselves out of the hot whirlpool into the cool evening air, running for towels. We went back to the room and woke up sleeping Josh and Caius so we could go to dinner. Tonight we opted to dine in the restaurant. The restaurant food was a little bit of a let down. Royal Caribbean have amazing food and this was rather ordinary. I did enjoy my steak, however. Mia put her head down on the table during entrée and never opened her eyes again. There was many empathetic smiles cast her way as she slept during our dinner. Caius was bright eyed and bushy tail after his 3.5 hours sleep and could not be contained to a restaurant seat so I dropped him up to Kids Club for some playtime. Josh & I went back to the room and put Mia to bed. We then watched a movie until the Marriage & Love show at 10pm. Luckily we had brought a pram with us on the boat so we tucked Mia in that with a blanket and brought her with us. A funny show with 3 couples from the audience – newly weds, 25 years wed and 58 years wed. The show yet again was very similar as the Royal Caribbean. Do these cruise ships all copy each other in everything? Who’s the spy? I’d love the job! During the show they asked for some ladies to come up and reveal their proposals. Never one to be shy, I raced to the stage to reveal the romantic proposal my husband made to me over 11 years ago. After the show we collected Caius and put him to bed with his sister. There was a party going on with a Mexican buffet opening at 11:30pm so I went upstairs to investigate. I grabbed some Brie and crackers, hot chocolate and churros and brought them back downstairs to my husband. The ship set sail about 12:30am that night. Goodbye Bahamas. Kids were in the bathroom watching the iPad this morning. Nice of them to try and be quiet, haha. Well until my little girl came out announcing she was starving. Considering she fell asleep during dinner I could see why. We tried the restaurant this morning for breakfast as I noticed it had eggs benedict. What a disappointment! The food was actually sitting in heaters in the middle of the room and the waiter was just there to go get it from the buffet and bring it to you. The eggs benedict was dry and I barely managed my way through one. All food in the restaurant of the Royal Caribbean cruise was freshly prepared. That was the difference of eating there compared to the buffet. Here on the Carnival the buffet line was even serving fresh eggs, so I am not sure what the point of the restaurant was. We spent the morning playing mini golf (yes there is mini golf on the boat, as well as giant chess, bean bag toss, jogging track and more). After mini golf Mia wanted to go to Kids Club again. Haven spent over 3 months with our kids since their last day care in Penang in October, we did not mind. Caius had no wish to go until he saw Mia going in and demanded to be with her. So glad those two love each other that much. After the kids were gone Josh and I headed to the Adult only spa. It was packed! So we ditched that idea and headed to the very top of the boat out the back where we blogged, read and generally just did absolutely nothing. 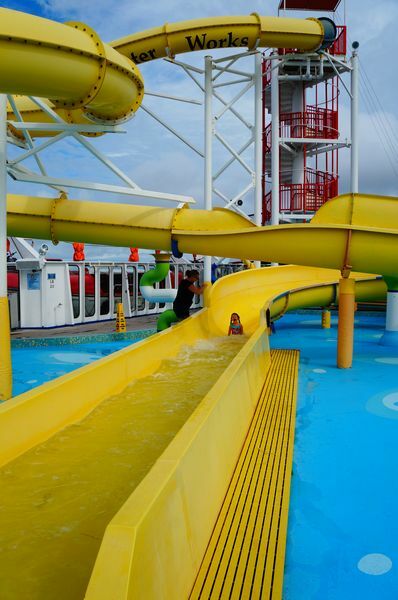 We didn’t have to watch the kids to make sure they were not drowning in the pool or climbing the ship rails and falling overboard. We didn’t have to answer emails or get distracted by Facebook. We just did nothing. Have you tried it? It’s rejuvenation for the soul. We picked up the kids about 2pm and Josh, Mia and Caius went for a nap while I sat by the pool reading and talking to whoever occupied the lounge chair next me. I checked on Josh and kids several times at 3pm, 4pm and 5:30pm. 3pm they were all still asleep. 4pm Mia was awake so I stole her from the room and we went and sat in the whirlpool making more friends for 1.5 hours. By the time we got out Josh and Caius were still in bed, but almost awake. When we walked into the dining room the kids were all eating together with some staff members who offered to take ours. So without the kids Josh and I made the 7pm show and then had a leisurely last dinner by ourselves in the dining room. We were served by a lovely guy from Denpasar, Bali who we spoke to for some length. It was nearing 10pm when we collected our children and all headed to bed. Josh and I had to pack up the bags to place them in the hallway for collection since tomorrow the boat was docking. After eating our last meal on the boat we grabbed our belongings and headed off the ship. We had no idea where we were going or how we were getting there, just some vague idea about a hotel near Orlando airport. A shuttle offered to take us for $25 each, kids free. The guy was so nice and after dropping everyone at the airport, actually drove us to several hotels to check prices and availability. We decided on the Comfort Inn and gave him a big tip. It wasn’t until we got to our room that we realized our stroller was missing. Did we leave it on the boat? Did we leave it in the car? I hope it can be found. I really love my Quicksmart. Comfort Inn were so good to us. We arrived at 10:30am and they gave us a room straight away. We spent all day and night in that room, getting food delivered, sleeping and resting. For tomorrow morning we had a 5am wake up call to fly to Mexico! And so ends our Bahamas cruise. Pure relaxation and socialization. 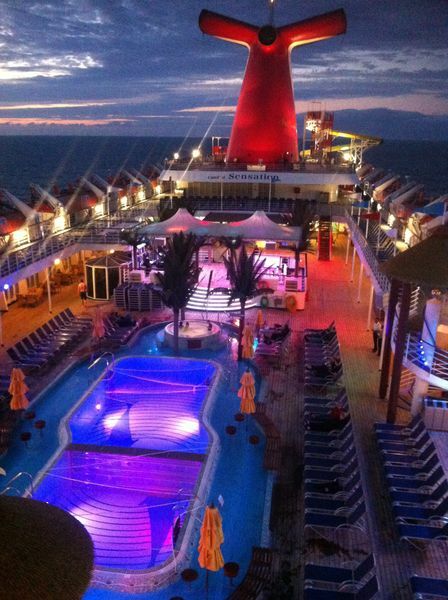 Have you ever been on a cruise? I hope this little post has helped you feel like you have. Would you like to go? Would love to hear from you! See all the food photos and cruise photos in our photo journal. What a great trip report! The picture of Mia asleep at the dinner table is priceless. How many hours a day total do you think they were in the Kids' Club? I really can't wait to give cruising ago. I'd love some alone time with Lee while travelling.